Have you ever held a steering wheel of solid ivory? Have you ever sat in bucket seats finished in mink? Have you ever looked out on the road over a bumper plated with 24-karat gold? Not bloody likely. Not unless you were the lucky Brit who won the Austin Healey 100-6 displayed at the 1958 Earls Court Motor Show. Not unless; you were one of a selected few owners that followed—including most recently Inan Phillips, wife of Bruce Phillips, who together own Healey Surgeons Inc in Takoma Park, MD a suburb of DC. It was, said the London Daily Express, the "world’s most flirtatious car." All the bright metal on the exterior of the car was gold plated, from the bumpers to the toothy grille to the rings around the headlights to the windscreen frame to the spinners on the gold-plated wire wheels. The disc brakes were gold plated. There was even a solid gold key ring with a gold model of the car. The seats were upholstered by "rally driver turned furrier" Lorna Doone Snow in "rare Champagne Diaden mink," used according to the Daily Express, "by the big French fashion houses." The door panels and dash were covered in Chinese kid. 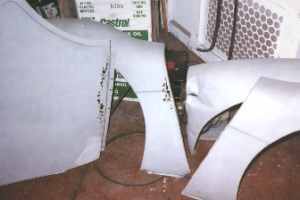 The steering wheel and all the usually plastic dashboard knobs were cared in solid ivory from the tusks of an African elephant. As a finishing touch, the car was painted ivory. To maximize the impact at the show, the car had been prepared at the factory in maximum secrecy. The car was, said the Express in stereo typical British understatement, "not a model of understatement." It was in its outrageousness; actually more in the tradition of the tarted-up production models which have always been the mainstay of the American auto show scene. Donald Healey was quoted as saying "It took 50 skilled craftsmen to produce the golden Healey. We really think it is the most sumptuously luxurious sports car ever made. And we made it as a tribute to British craftsmanship." Balderdash and poppycock, of course. Healey did it not as a tribute to anything but to draw people to the Healey stand. And, anyway, one suspect those were the words not of Donald Healey, but K.A. Gregory, personal consultant to Healey at the time and whose concept the golden Healey was. It most certainly caught the attention of the Daily Express, which bought the car as it stood on the stand and offered it as a contest prize while the show was still running. No one seems to remember now who the winner was, except that the car was sold shortly afterwards to a wealthy businessman who gave it to his wife. After going through several other hands, the golden Healey landed (where else? ); in a barn where it was discovered by a friend of Inan and Bruce. The Phillips bought the car sight unseen almost 25 years exactly after its debut. 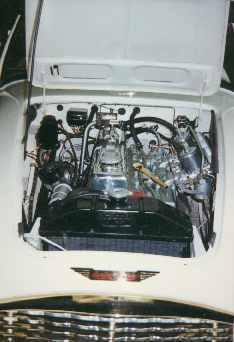 Despite the car’s deplorable condition, the owner was initially unwilling to sell it out of England, yielding only after being convinced that these Yanks, what with their Healey credentials of some 14 years, had honorable intentions. The restoration was substantial. Rust showed through the gold plating and, as a result of special panels added to the car to make it look good on the show stand, the car had rust in some rather unusual places. The upholstery was frayed and torn and the ivory had cracked and shrunk. Although the mechanical and bodywork was performed at Healey Surgeons, new gold-plated stainless steel spoked wire wheels were made by Dayton Wheels (at about $1000 per wheel), the gold plating of the bumpers and body trim was performed by the same company that gold plates for Rolls Royce (no firm in the US with tanks large enough to plate the bumpers could be found). And it wasn’t just the big pieces that got plated. There were fender beads, bags of screws. It was quite a sight spread out on the workbench, says Inan. The reupholstering, in mink like the original, was done by Martin J. MacGregor Coachtrimming in Dundas, Ontario. It took 27 baby goats to cover the interior, the Phillips were told. Today the Healey resides at Healey Surgeons and is driven to car shows and similar affairs, albeit only in fair weather. 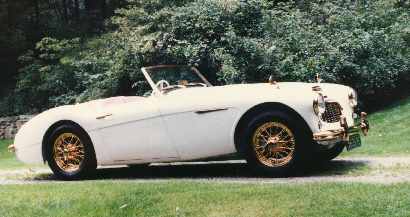 Granted that putting gold on a Healey may be like putting lace on a bulldog—though The Duke could wear a tux and nobody went poking him with a sharp stick. And maybe that’s what the golden Healey is. For under the jewelry the golden Healey is still very much a Healey, still rough and ready, still shaking the floorboards with its basso exhuast, still one of the best shapes ever to come off the island of the Union Jack. And bloody likely the most special Healey ever made.